Bring history and culture together with mind-boggling wildlife encounters combining these two world-class South American highlights in one trip. Length of trip varies depending on Galapagos cruise. 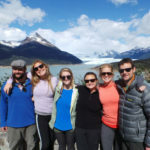 Fascinating history and culture come together with mind-boggling wildlife encounters while lush cloud forest and Andean peaks are contrasted by placid turquoise waters and white sand beaches as you combine two of the world’s most fascinating destinations for the ultimate South American exploration. Fly to Cusco and explore Incan stone terraces at Sacsayhuaman, along with other fascinating Incan sites as you head into the Sacred Valley. Continue on to charming accommodations for a relaxing evening. Visit the isolated Amaru indigenous community learning of their lifestyle and textile production. 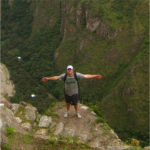 Visit Pisac ruins before bargaining for wares in the vibrant market below. Visit Incan agricultural terraces and pre-Columbian saltpans before taking the train along the Inca Trail to Machu Picchu Pueblo. 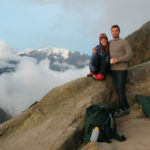 Revel at the sunrise from the Lost City of Machu Picchu perched amidst Andean peaks and lush cloud forest. Enjoy a complete guided tour of the site with time to explore on your own as well. Train to Ollantaytambo and see the vast Incan ruins towering above. Lunch at a colonial-era hacienda before continuing to Cusco. Enjoy the day at your leisure exploring dynamic Cusco. A short flight to Lima and onward to Quito, Ecuador. Explore Quito, taking in the history and architecture on your privately guided discovery of the city. Visit the center of the world as you experience how it feels to stand directly on the equator. Fly 600 miles over the Pacific to the Galapagos Islands where you are transferred to your vessel and begin exploring the Galapagos on your luxury cruise. Return flight to Quito and connect to your overnight international return flight home. Exceptional for all ages as well as for families, this multi-country itinerary features exceptional guides, hotels and yacht, cuisine, and excursions throughout which allows you to maximize an incredible itinerary. Knowmad has vast knowledge and operations in Peru and the Galapagos Islands; this is a private trip and we are happy to modify excursions, accommodations, and the flow of the itinerary to perfectly suit your travel style and interests. Listed prices are approximations. All Knowmad trips are custom and exact pricing is provided in your trip proposal. Additionally, regional airfare is estimated at $1,250 (Lima/Cusco & Cusco/Lima, Lima/Quito, Quito/Galapagos & Galapagos/Quito—subject to change). Note: Trip length and price will vary depending on your Galapagos cruise. LIGHT TRIP Trips suitable for nearly all ages and ability levels. Walks are generally short and on flat terrain. Activities include cultural opportunities, history, optional hiking, train ride, shopping, yacht cruising, snorkeling, walking, optional kayaking. DEPARTURES Year round; can be set up to match your dates. Airfare is not included in the land cost of our trips. You may arrange your airfare independently, or we are happy to offer assistance in helping you book it. Regional flights for this trip (excepting the Galapagos flights) would include: Lima – Cusco, Cusco – Lima, and Lima – Quito. Ready for the trip of a lifetime? Signing up is easy. Call us at 612-315-2894 or email travel@knowmadadventures.com and reserve your spot. Or simply download our registration form, fill it out, and send it back to us along with your trip deposit. Please refer to registration form for terms & conditions. This trip partly takes place in the Peruvian highlands. Throughout the year the average temperature is in the mid-50s °F (10-12 °C) and does not fluctuate greatly. Evenings are cooler. There are primarily two seasons: wet and dry. December through March sees much more precipitation than other times of the year and is the less visited season. As Peru has three distinct climate zones, if you are interested in combining this trip with a visit to the jungle or the coastal areas please inquire for more weather details. Weather in the Galapagos Islands is unique. December through May is considered the rainy season but oddly enough it is also the sunniest time of the year. The water is also warmest during these months, which makes for comfortable snorkeling—yet many species of fish wait for the cooler waters later in the season. Between December and May is breeding season for birds and the mating rituals are fantastic. You can also see sea turtles nesting and sea lions mating. The ocean is calmer during these months as well, so if you’re prone to sea sickness keep this in mind. In February, March and April most all of the Galapagos flowers are blooming. Between the months of June and November the weather is a little cooler, cloudier and windier, but it can also be a great time to visit the Islands. The Humboldt current arrives during these months, bringing cold water and lots of nutrients and plankton, resulting in a myriad of fish and bird life. This is the best time for diving. Prior to your departure, you are provided a detailed pre-trip information packet including a recommended pack list, information about the regions you’ll be visiting, suggested readings, up-to-date health information including any recommended vaccinations and more. Our trips feature comfortable accommodations that complement their surroundings. We seek out intimacy and character, but never sacrifice cleanliness and security. We also find the best value for quality. In general, our physically moderate to vigorous trips feature hotels classified as 3+ to 4 stars, while less physically demanding trips feature 4+ to 5 star hotels. As South American travel specialists, we’re experts and have inspected hundreds of properties. Knowmad is happy to suggest upgrades and alternative hotels based on your preferences to ensure your trip is perfect for you. Photos below are from this itinerary’s preferred accommodations. For more specifics, call or write to request more info, or download the detailed trip itinerary. You will fly from the USA to Lima, arriving most likely in the evening. Upon your arrival in Lima you will be met at the airport and assisted in crossing the street and checking in to the hotel adjacent to the terminal. In the morning, you will be assisted in crossing the street to the airport. After your short flight to the former Incan capital of Cusco where Andean cultures come alive (don’t be surprised when the language doesn’t sound like Spanish – it is most likely the native Andean tongue Quechua), you will be met at the airport and taken for lunch. Departing for the Incan sights outside Cusco, you will visit the fortress Sacsayhuaman and its megalithic stone terraces; Kenko, with its carved stone surfaces and subterranean altars; the Puka Pukara fortress that protected the royal capital from attacks; or the water temple, Tambomachay. Continuing through the mountains with inspired views of the snow-capped Andean peaks, you will descend into the Valley of the Incas and check in to your accommodations. Take the afternoon to unwind, explore, and acclimatize. 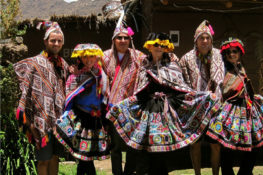 After breakfast, you will head by van along the Sacred Valley past the remote Andean communities of Calca, Coya, Lamay and Pisac until you arrive at the Amaru community. This isolated community holds strongly to their ancient customs and practices a largely subsistence lifestyle on the slopes of the Andes. The Amaru will proudly open their village to you where you will learn of their lifestyle and traditions. Among other things you will take part in gathering plants used as natural dyes, learn of their medicinal and culinary properties, and see how the Amaru’s world-renowned textiles are woven and brought to life. You will also enjoy lunch at Cuchara de Palo, a local restaurant that celebrates organic and traditional Andean ingredients grown locally. After your lunch you will make your way to Pisac – one of Peru’s largest and most vibrant markets – where you can bargain with Andean campesinos for handcrafted wares. At the end of your excursion you will be returned to your accommodations. Heading out early you will arrive at the Inca agricultural terraces of Moray, a little-known site thought to be an ancient Incan agricultural laboratory. From here you will continue on by van or hiking (dependent on your preference and weather conditions) to the fascinating site of Maras where you will see ancient saltpans still being harvested in the traditional way. Enjoy a gourmet picnic lunch in the shadows of the Andes on this day as well. In the late afternoon you will board the train that chugs along the Urubamba River and parts of the Inca Trail, arriving in Machu Picchu Pueblo to enjoy the evening at your leisure. Early risers can watch the sunrise from the Machu Picchu citadel or make the early morning climb to Huayna Picchu. This incredibly vast archeological site – lost to the world until well into the twentieth century – is perched amongst Andean peaks and lush cloud forest making it one of the most breathtaking sights in the world. You’ll have the opportunity for a complete guided discovery of the site as you begin to unlock the mystery of the Inca, and will also have some time to explore the ruins on your own. Following lunch at the adjacent Sanctuary Lodge, you will head back into the ruins for the afternoon to continue your exploration of the incredible site. Afterward, you’ll be brought to your accommodations to spend the evening at your leisure. Taking the train after breakfast, you’ll have time to roam through Ollantaytambo town while reveling in the ancient ruins. Heading into the Sacred Valley you will stop to enjoy lunch at an authentic colonial-era hacienda where you will appreciate a blend of Spanish traditions and indigenous customs, as well as a private museum collection, before continuing on and arriving in Cusco to enjoy the evening at your leisure. Enjoy the day at your leisure independently exploring Cusco, one of South America’s most dynamic cities. Visit Incan architectural jewels such as Korikancha – the temple of the sun, shop at Andean markets, enjoy incredible Peruvian cuisine, or see the colonial cathedrals built atop Incan foundations around the Plaza Central. This morning you will be picked up at your accommodations by and transferred to the airport in accordance with your onward flight to Quito, Ecuador. 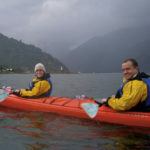 Upon arrival in Ecuador, you will be met by a Knowmad Adventures representative and transferred to your accommodations. Enjoy the evening at your leisure. Today you will be met at your accommodations by a Knowmad Adventures guide for your full-day guided exploration of Quito. Enjoy discovering the city as you walk down quaint cobblestone streets lined with brightly colored colonial houses and balconies dressed in flowers. Visit the Plaza de la Independencia and the impressive La Catedral de Quito, one of the oldest cathedrals in South America. Next, see the Presidential Palace along with other historically and architecturally rich buildings surrounding the square. Your guide will also take you to churches built around the 16th and 17th centuries including the monastery of San Francisco, which was started just five days after the founding of Quito in 1534. Lastly, visit Panecillo hill for spectacular views of this incredible city. After lunch at a traditional Ecuadorian restaurant you will visit the fascinating Intiñan museum, dedicated to the promotion and study of the nations that inhabited the equatorial area. Enjoy the artifacts, totems, sundials, and portions of an original village at this museum, as well as the marvel of being at the center of the world on the equator. In the morning you will be met at your accommodations and transferred to the airport in accordance with your onward flight to Baltra in the Galapagos. To ensure that no foreign plants or animals are introduced to the islands, your luggage will be inspected at the Quito airport. Upon arrival in Baltra, you will first pass through an airport inspection point where your TCT (Transit Control Card) will be checked and stamped (please keep this carefully with your passport as you will need to show it again when you leave Galapagos). You’ll be met at the airport and transferred to the yacht and shown to your cabin where you will have some time to get settled. After a briefing onboard about the boat and the island, you’ll embark on your cruise visiting Bartolomé Island, a small barren island famous for Pinnacle Rock, a volcano cone formed by magma expelled by an underwater volcano. A trail of stairs leads to the summit of the volcano, boasting one of the best views of the island. The beach is perfect for snorkeling and possible sightings of the Galapagos Penguin. Today you will land on Genovesa Island at Darwin Bay, a beautiful beach formed by the rim of a sunken crater. Here you will walk a short trail that winds through the mangroves filled with frigatebirds, yellow warblers, yellow-crowned night herons, pintail ducks, red-foot boobies and the great terrestrial finch. In the afternoon you will arrive at a rockfall that forms a natural staircase up the cliffs, known as Prince Phillip’s Steps or the “Stairway to Seabird Heaven.” Here, a marvelous view from the lava ridge compliments the continued sightings of a variety of tropical land birds. Head to Espumilla Beach by wet landing this morning. A popular place for marine iguanas and Sally Lightfoot Crabs, you may be able to witness the crabs attract the hunting herons. Snorkel and swim from the beach, perhaps spotting some of the local marine life. Next you’ll head to Buccaneer Cove, a safe haven where pirates in the 1600 and 1700’s would stake out on the Northwestern side of Santiago Island. Sea turtles now take the pirates’ place and dig their nests for their eggs near the Mangrove trees. It is a great location for snorkeling and many marine birds and sea lions can often be found here. Your day’s discover will continue on to Egas Port, a well-known site in the Galapagos Islands that is also known as James Bay on the western side of Santiago Island. There are trails that lead to tide pools with lava lizards scattering along the trail and remains of an old salt mine operation that was eventually unsuccessful can be seen on one of the trails. 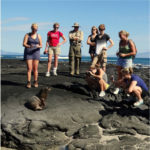 Fur seals and marine birds can be seen nearby and snorkeling is a popular activity. Begin your day venturing to North Seymour Island. Galapagos sea lions, blue-footed boobies and magnificent frigatebirds are abundant on North Seymour Island. The island was formed by a series of submarine lavas containing layers of sediment that were uplifted by tectonic activity. Afterward, you’ll continue on to Santa Cruz, home to six different vegetation zones. In the afternoon, you will visit the highlands of the island that are located in the north and can reach elevations up to 1500 mt. You will have the opportunity to walk along the path that leads to wildlife spotting of giant tortoises, mockingbirds, Bahama ducklings, White-cheeked Pintail ducklings, Darwin finches and many others. You will also come upon the underground lava tubes, which are more than one kilometer long. Walking through the lava tubes offers a surreal experience. You will then continue on to the Charles Darwin Station, an organization that provides scientific assistance to ensure the proper preservation of the Galápagos. This is home to the tortoise ranging in size from 4 inches to 4 feet long that interact with each other and possibly with you. Enjoy one more morning exploring the Galapagos Islands. Visit the Mosquera Islet, a reef of rocks and coral that has one of the largest populations of sea lions that’s home to many shorebirds. Soak in the magnificent animals of the Galapagos once more before being transferred to the airport for your flight to Quito. Upon arrival in Quito, you will be independently responsible for making your way onto your overnight, international return flight home. Just a short flight from Cusco, spotting troops of monkeys, colorful macaws and countless bird species, giant sloths, caimans, and maybe even a jaguar or puma in the Amazon Jungle is a traveler favorite. We have scoured the jungle lodges of Peru and can advise you on which experience fits you best while guaranteeing the best value. With the most intact colonial character in all Ecuador, Cuenca is both regal and relaxed. This popular Galapagos extension will have you exploring the history, character, and people in and around town. An ideal Ecuador extension for those looking to experience the countries traditional cultures, small towns, scenic landscapes, and colonial architecture in a limited amount of time. Planning a trip to South America might seem a little overwhelming at first. Knowmad offers door-to-door trip planning: first, we listen, and then we help you navigate the seasonal differences and itinerary options, resulting in a holistic, seamless, and custom-crafted experience, all at a guaranteed best value. The simplest way to get started is to give us a call at 612-315-2894or to fill out this short form so we can learn more about your travel preferences. Like what you're seeing but want to make the itinerary a little more you? It's easy! Or fill out this simple form online and we'll get back to you.